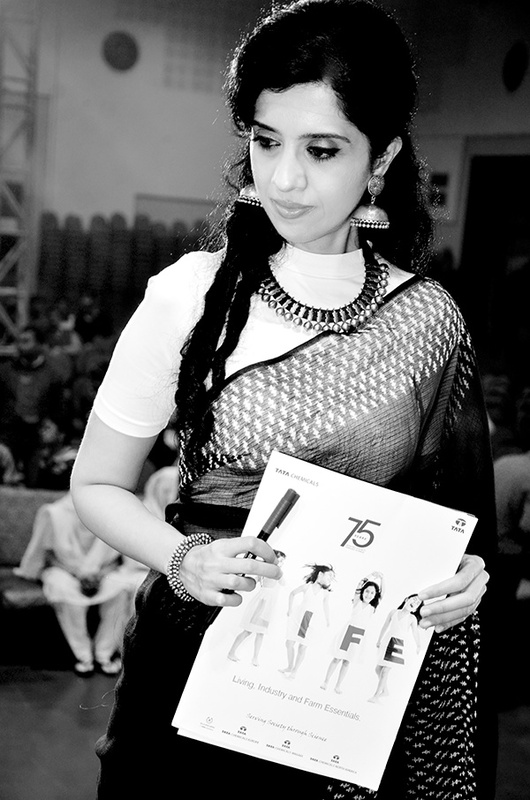 The name “Tata” immediately evokes a sense of respect and awe in any Indian. And rightly so! Tata Sons has been a driving force in the Indian economy, with their wings spread across many sectors- steel, hotels, chemicals,etc. Being one of the largest business conglomerates in our country, their corporate culture and ethos is unparalled, running across the many threads of its organization. 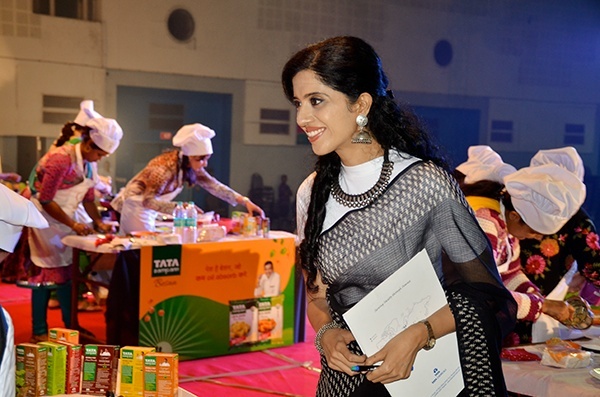 If you come across Tata employees of any sector, you cannot miss the warmth exuded by them. 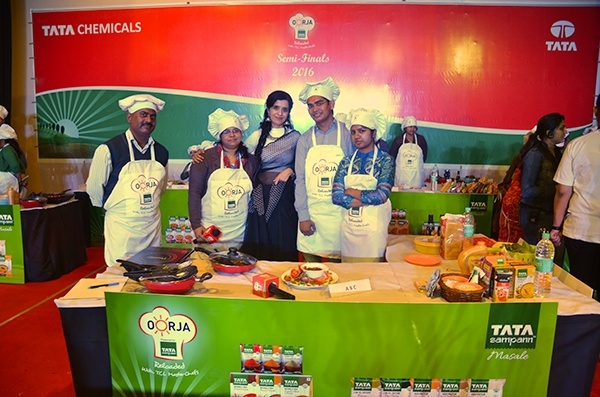 This is one company I have always admired and when they approached me to judge the semi final round of Oorja – TCL masterchefs in Babrala, UP, it was an offer I could not resist! 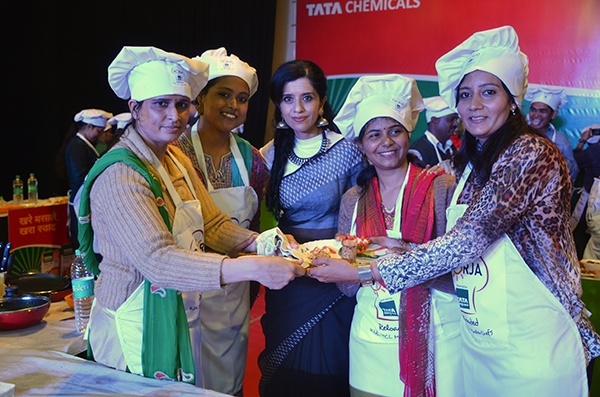 Tata Sampann, a brand of Tata Chemicals has some great quality ingredients under its belt- salt, dals, masalas and a host of new products are also being launched under this brand. 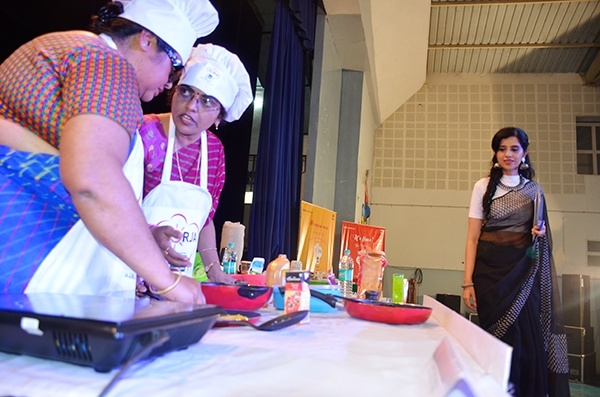 The cookery competition powered by Tata Sampann gave an opportunity to the participants to use Tata Sampann products and showcase not just their cooking skills, but also other aspects like creativity, innovation, presentation skills and the like. And show they did! 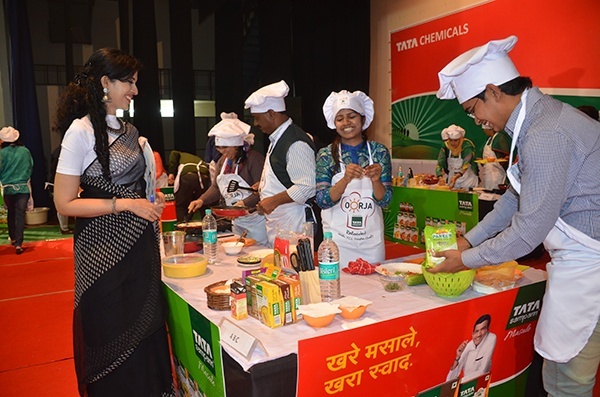 Ten teams were selected after a preliminary elimination round conducted in TCL plants and offices. 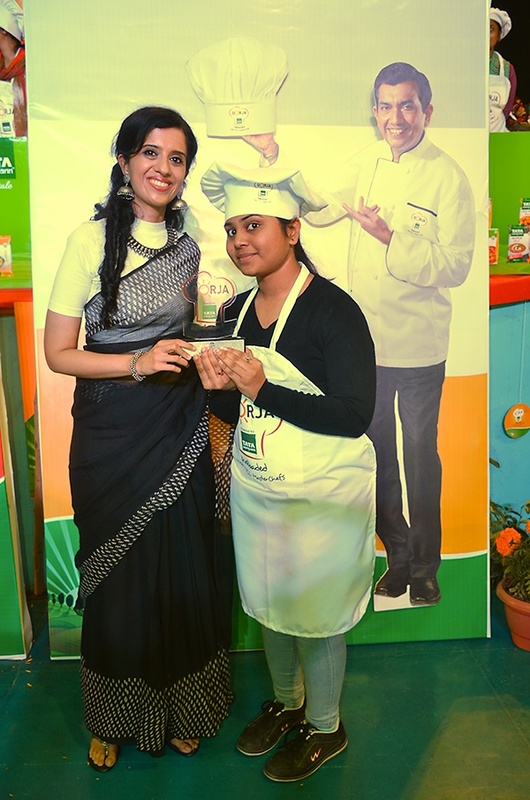 And my job was to select two teams that would enter the final competition that will be judged by the grand doyen of Indian cuisine, Sanjeev Kapoor. 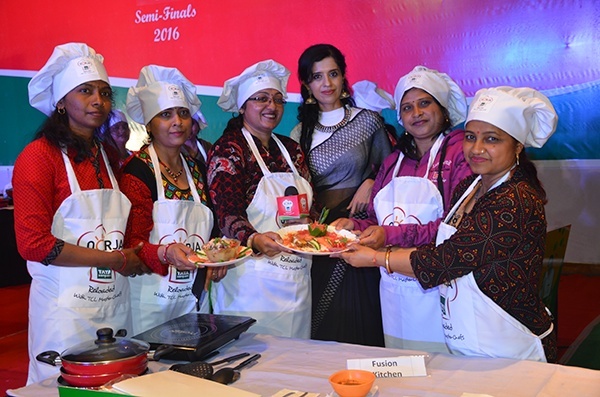 As the buzzer went off, all the 10 teams got into action to prove their culinary might! 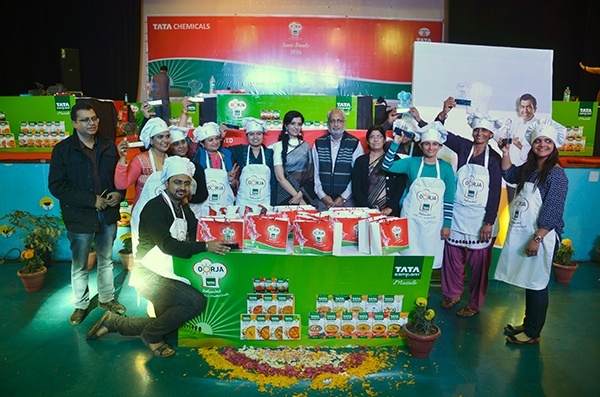 Within 35 minutes they produced an array of dishes using the fresh ingredients given to them alongwith the Tata Sampann products. 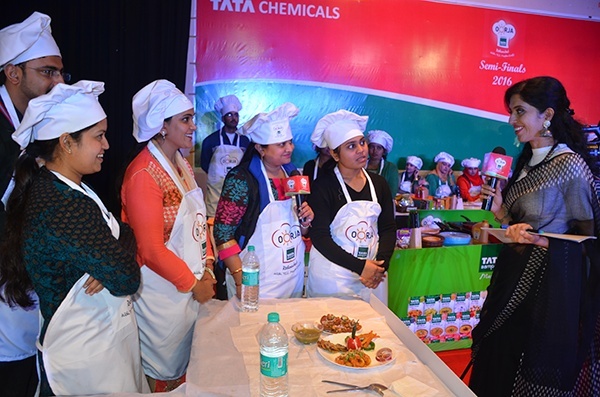 Fifteen minutes into the competition, the mystery box was given to each team and they had to incorporate either one or both of the ingredients into the dish that they had chosen to make. As the pressure built up with the passage of time, I keenly observed how the participants interacted with each other. And it was hard to miss the partnership and the cooperation between the teams. Looking at the energy and creativity on display, I wished that I could select more than two teams, that I was assigned to judge. But given the task, the job had to be done and let me tell you considering the talent levels of some of these people, it was not an easy one. I had several criteria ear marked for delivering my verdict. 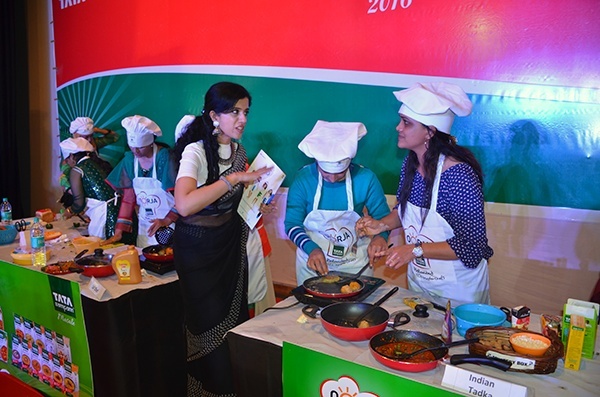 Taste, presentation, cleanliness, innovative use of ingredients, the right use of masala, etc. 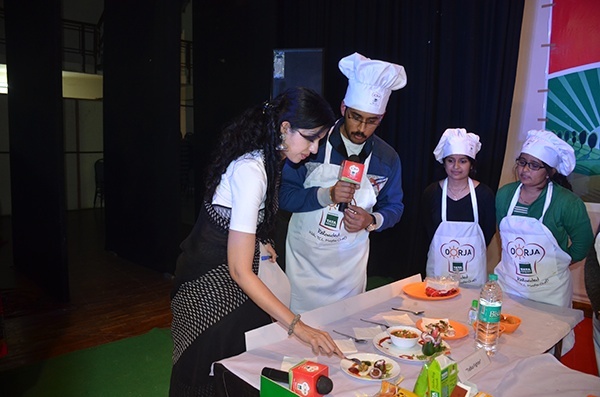 While it was quite easy to judge one team who cracked the taste and presentation aspects, it was extremely difficult to choose the other team as there was a tie between 4 teams who were very close to each other. While some of them got the presentation right, the others got the taste right. Finally, after much contemplation it was decided to pass the baton to the team who got the taste to the tee. 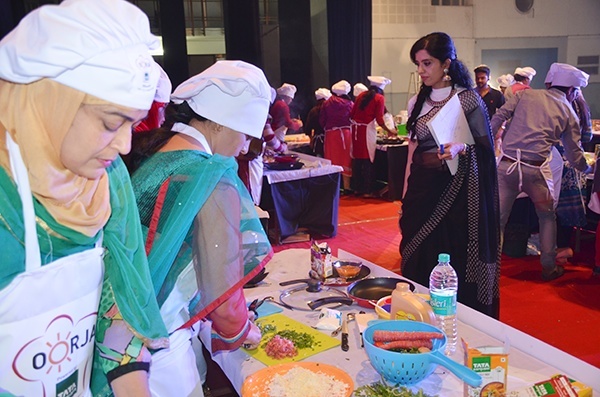 Presentation skills can be improved upon, considering this is the semifinal round, but getting the taste right is the most crucial aspect that can be a result of practice, intuition, skill and something that is not easy to master. The warmth, affection and enthusiasm exuded by the participants as I walked from one team to another is something that I’m going to cherish for a lifetime. And now onto some pictures to give you a gist of this event. 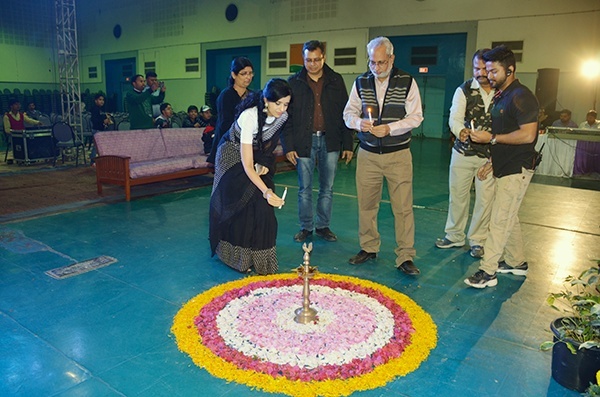 Lighting the lamp at the beginning of the event with the plant head of Tata Chemicals Babrala, Mr. S Bhasker, Mrs Bhasker and Head of HR and Admin, Mr. Umanand Jha. A little bit of humour for good measure! With team Annapurna! 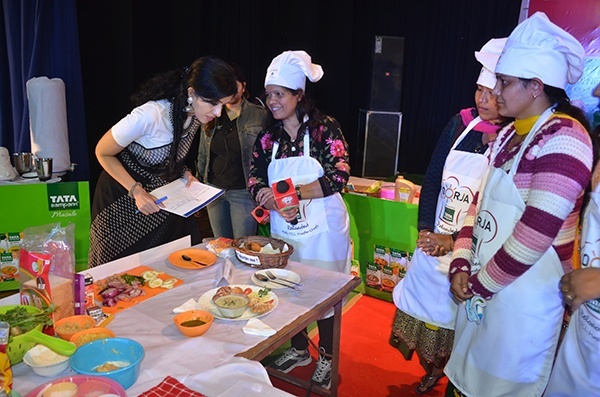 They were really good with their presentation and innovative dish (dahi wada made with bread) and I wish they were going to Mumbai! 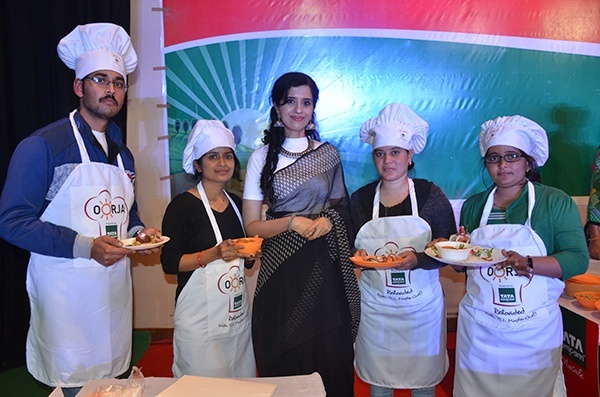 With team fusion kitchen- this team made a beautiful presentation with a gift parcel that is etched in my mind. 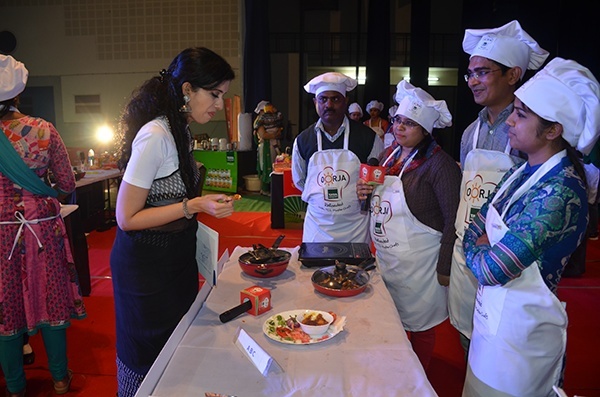 The ABC team from Noida who made a dish that could put any restaurant gravy to shame! The winning team put up a great show! 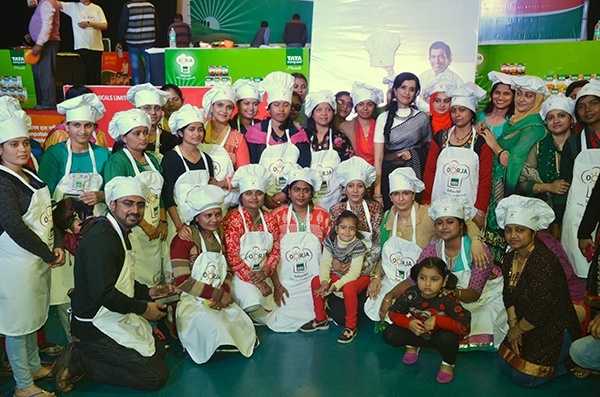 Team Tadka fighters put up an impressive show making 3 dishes. Their gnocchi and sandwich was great! I wish they could go to Mumbai too. 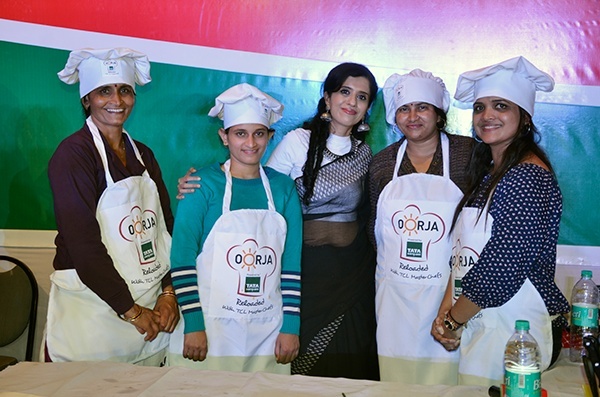 I cannot forget the warmth and affection showed by the woderful ladies of team La chef! You rock! Keep up the enthusiasm and I hope you will participate again. 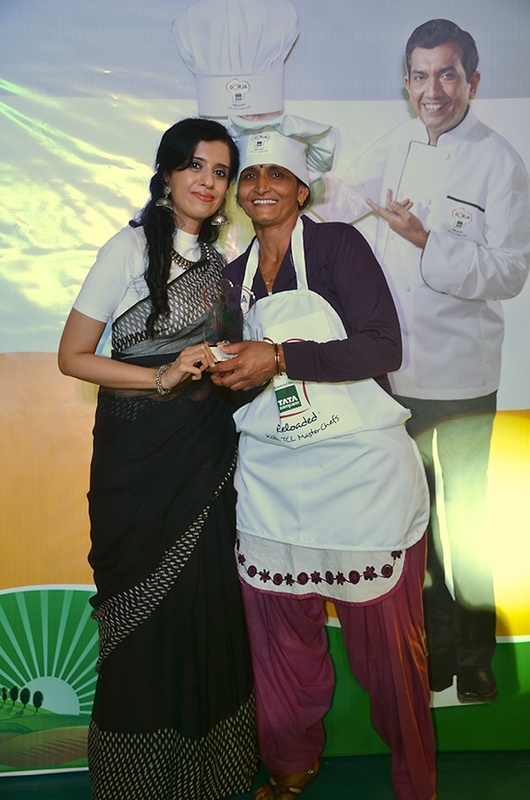 Another winning team- Indian Tadka. 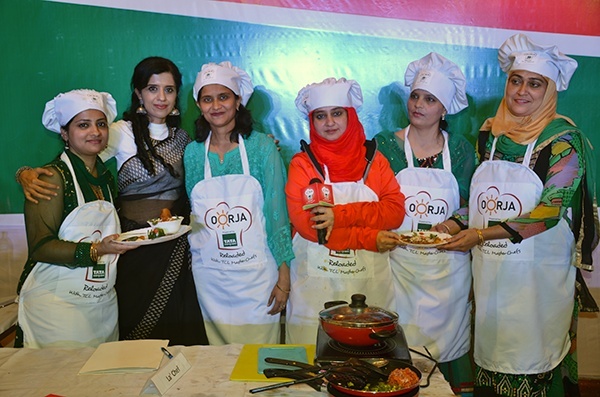 The flavours of Indian cooking and the correct usage of spices were the highlight of this team resulting into a perfectly balanced plate of taste and texture. And I was really surprised with the fact that they made great rotis without the chakla and belan (rolling pin). A few words to all the participants- happy for those who won and sad for those who couldnt make it! 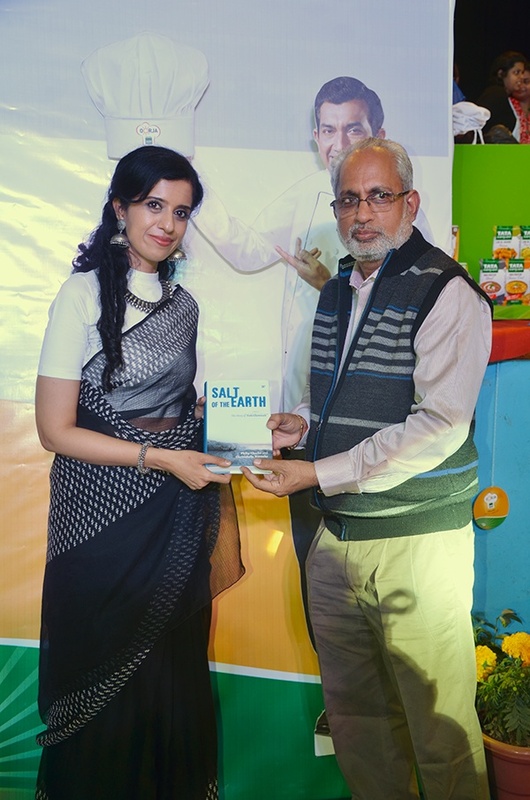 Mr. S. Bhasker, handing me the book- Salt of the Earth- The Story of Tata Chemicals. With a background in chemistry, I look forward to reading this book. With the winners and some members from the top management of TCL, Babrala! 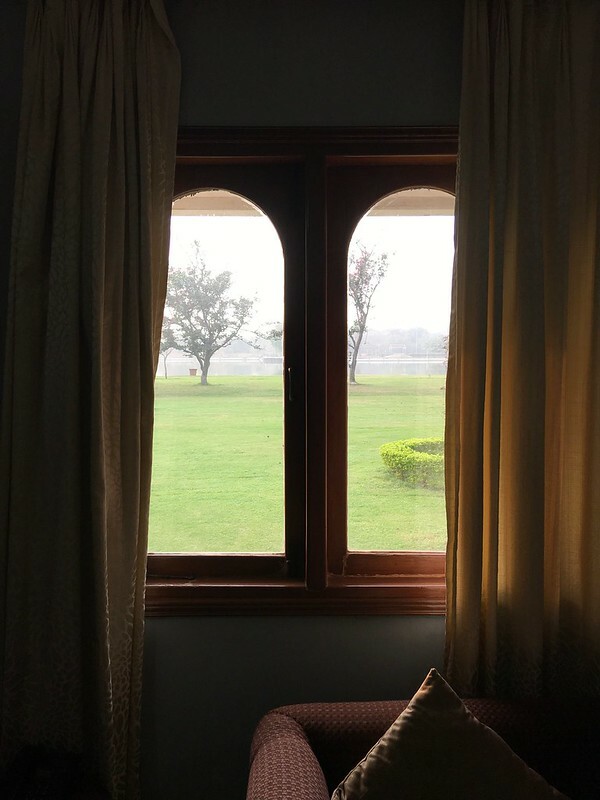 The view from my room on TCL, Babrala campus. 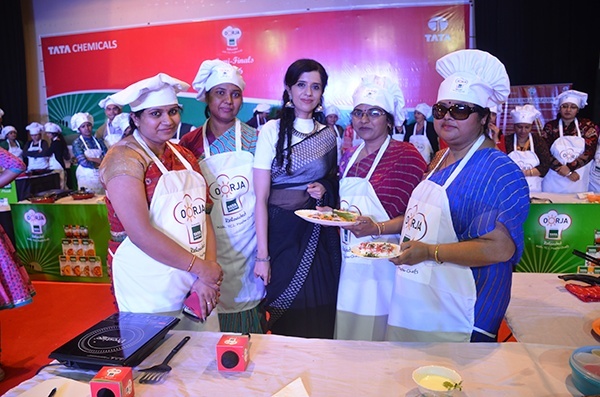 The warmth, hospitality and congeniality exuded by the Tata folk is something that I'm going to treasure for a long time and I'm glad that I was able to experience this event and I look forward to judging the next event at TCL Mithapur in Gujarat. I can tell you enjoyed the event. keep it up. I have not read the full article you have written only part of it I read. Thanks for sharing the wonderful experience. will read fully on Saturday/Sunday. Congratulations, it must have been an exhilarating experience. 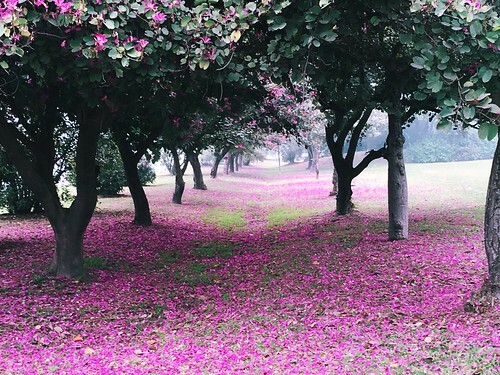 You look so pretty. I admire your achievements. My heartiest congratulations. Thank you everyone, for all your kind words! You folks are truly amazing! 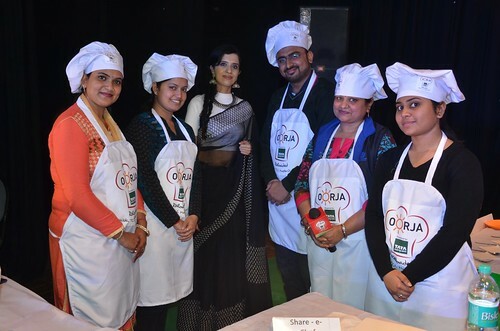 Hello mam!I am from TCLMITHAPUR.First of all its my or to say our great pleasure to be with you on 27th feb in OOrja TSM event.Our team named was cutcut.it was great experience for me in my life.I never participate in my life like this,but I am fully passionate for it. We were not qualified for finals but beside that part I learned and experience many things in few hours.thanx to our TCL to give us this kind of platform ,which give us some great experience,and thanx to you for great job.I hope I see u again .thank u again from all of us.JAY SHRI KRISHNA,which our custom to giving someone to all of goodmighty. Sunita- Jay Shri Krishna! Nice to hear from you! I appreciate your spirit! Like I said, in a competition someone wins and someone loses, but people like you with the right approach are true winners all the way! Would love to meet you again too. 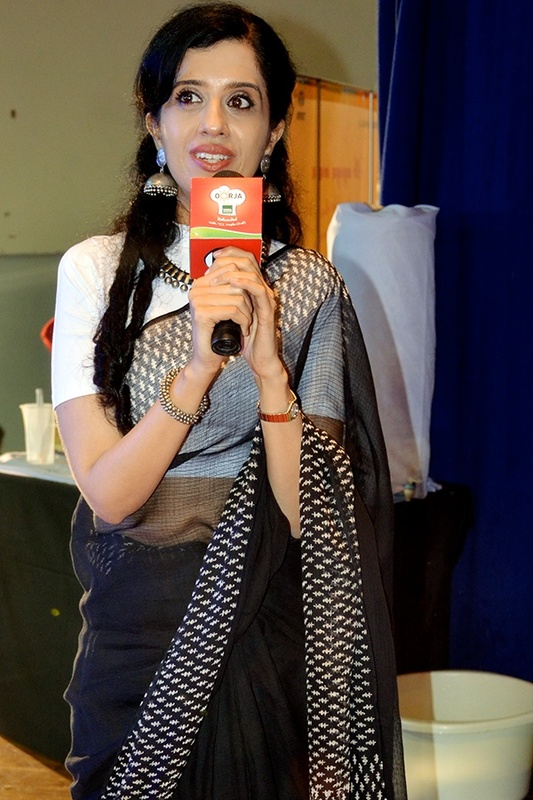 Arifa- It is totally my pleasure to talk about you all. Yes, God willing, would love to meet you again!